Stradis SDM290ex is a rock solid and fully featured hardware-based SD decoder that is suitable for the most demanding professional applications. It decodes MPEG 4:2:2 profiles at up to 50 Mbps and provides continuous, frame-accurate back-to-back playback of all standard MPEG2 streams. For maximum flexibility, Stradis SDM290ex features several video outputs including SD-SDI (SMPTE259M), RGB/analog YPbPr, S-Video and composite . 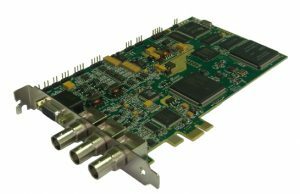 On the audio side, it decodes up to 8 embedded audio channels over SDI in addition to outputting AES3 digital audio and both balanced and unbalanced analog audio. The Stradis SDK/API developer kit allows one or several Stradis SDM290ex decoder cards to be integrated and controlled into a video system quickly and easily. It provides a full control of the features and supports synchronized playback across all cards. SDK/API compatibility is ensured across the complete Stradis product range allowing a seamless upgrade to a different decoder. Through a machine control interface (RS-422), the Stradis SDM290ex can be configured as either a controller or a device.